To be released on 6 June 2019. You can pre-order this product. We should be able to to ship on Wednesday, 5 Jun 2019. 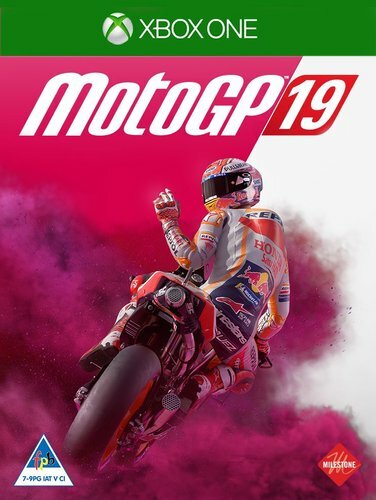 MotoGP™19 celebrates the motorsport with brand-new elements! Challenge your friends, create your pro-level event and become a race director in the most complete and lag-free multiplayer experience ever! Re live the greatest rivalries with the Historical Challenges that brings back to life the history of the discipline by recreating the most famous episodes of its riders, bikes, and teams. Compete with a faster, smarter, and more accurate AI, based on machine learning, seen for the first time in a racing game! Play the part of your favorite official rider in the 2019 Championship and race on the 19 different tracks! Discover all the classes: Red Bull MotoGP™ Rookies Cup, Moto3™, Moto2™, and MotoGP™ and the brand-new MotoE™. Unleash your creativity with new tools to make your rider unique! Create your own style, choosing between the widest selection of brands and accessories ever and enjoy the new graphics editors! Combine fonts and shapes to personalize your lower back patch, helmet, and racing number or download the creations of other players! Start as a rookie in the Career and climb up the ladder to the top class. And when you are ready for a harder challenge, set up the Pro Career mode and start as a professional MotoGP™ rider! Improve the performance of your bike electronics during dedicated tests and plan your strategy to be the best! The third season of the MotoGP™ eSport Championship is back. Will you conquer the podium?